Ontario’s Southwest is home to some of Canada’s most fertile farmland and a rapidly evolving wine, craft beer and farm-to-table scene. Get a taste for the things growing here at our many wineries, restaurants, breweries, markets and farms. We’ve created the Next Stop: Taste video series to help you head out on a taste tour throughout our region and invite you to watch for an even closer look at our full crop of experiences. Take some of Canada’s most productive farmland and fresh water and add a generous helping of families who are passionately committed to producing world-class products in the region they love and what do you get? Beautiful Belgian Blondes, luscious fields of lavender, mouth-watering maple syrup and a plate of fresh perch tacos that will leave you hooked. This Next Stop: Taste adventure begins in Norfolk County, where a family of passionate brewers has reclaimed a former public school and transformed it into Simcoe’s New Limburg Brewery. Enjoy a diverse range of brews in a cozy taproom and stock up at their retail store. Next stop is Bonnieheath Estate Lavender and Winery in Waterford to relax with a glass of their delicious wine or hard cider, shop for lavender luxuries made right on site, and take a guided walking tour or wagon ride through the fields of purple. Richardson’s Farm and Market in Dunnville provides a taste of some of the region’s freshest farm-to-table flavours paired with fun activities: wagon rides into the field to pick berries, a five-acre corn maze, pumpkin picking, sugar bush tours and pancake feasts. The next logical step is to see how local produce tastes when it’s transformed into delicious dishes. While The Combine’s perch tacos are definitely a must-taste flavour when you’re this close to Lake Erie, the Simcoe restaurant’s Chef’s Table experience is a dining experience that you won’t want to miss. The pride the producers in Ontario’s Southwest feel runs deep and is rooted in a strong love for the land. Taste that sense of place for yourself in a just-foraged spring leek, a hand-scooped cone of freshly churned ice cream, a pint of Dead Elephant Ale or a perfectly chilled glass of crisp Saignée. This Next Stop: Taste adventure begins in Port Stanley, where a young couple returned to the family farm for a beyond-organic lifestyle. From their farm the owners fuel The New New Age with products comprised of only the highest quality, whole food ingredients that have been either permaculturally grown, certified organic, or ethically wildcrafted and never exposed to harmful chemicals or irradiation of any kind. Travelling on to St. Thomas leads you to a local landmark: Shaw’s Ice Cream, where ice cream has been produced since 1948. Today, three sisters carry on the tradition, making over 50 flavours of ice cream with fresh, local cream and the purest flavourings. The town’s Railway City Brewing Company offers tastings, tours and a lesson in local history (the craft brewer’s Dead Elephant Ale is a tribute to the beloved circus elephant, Jumbo, who was killed in a railway accident in 1885). Don’t leave the area without a tasting at Quai Du Vin Estate Winery — music lovers will want to time their trip with one of their fun outdoor summer concerts. Tastes: Getting cheesy in Canada’s Dairy Capital, a winery rises from the ashes of a tobacco tract, Ontario’s only brewery farm and some killer sweet potato gnocchi. Taste the can-do attitude of some of Ontario’s most determined food, wine and beer producers in Swiss-style cheeses, Appassimento-style wines, craft beer made with locally produced hops and some killer sweet potato gnocchi. This Next Stop: Taste journey begins just outside of Woodstock, where a dairy farmer’s son has built a reputation as one of the country’s best cheese makers at Gunn’s Hill Artisan Cheeses. What goes better with all that cheese than wine? Head to St. William for a taste of Burning Kiln Winery’s appassimento-style wines. In a nod to the farm’s past, Burning Kiln uses former tobacco kilns to dry their grapes. While you’re in the area, take the opportunity to taste a truly local craft beer at La Salette’s Ramblin’ Road Brewery Farm, Ontario’s first and only brewery farm. Taste the difference that locally produced hops makes, and pick up a few bags of the kettle chips made onsite. Wrap up a day of tasting and touring with Chef Dan Megna’s signature farm-to-table cuisine at Twisted Lemon Restaurant in Cayuga, featuring locally sourced meats and produce and a lively open-concept kitchen, showcasing the culinary team in action. Tastes: Foraging fiddleheads, chocolate with a local twist, a Mark Twain-inspired brewery and market-to-table dining that’s all in the family. From fiddleheads and maple syrup to lavender and just-picked veggies, the chefs, chocolatiers and brew masters of Ontario’s Southwest get endless inspiration from the bounty in their backyards. This Next Stop: Taste journey begins at SixThirtyNine in Woodstock, Chef Eric Boyar’s buzzed about farm-to-table dining destination. In addition to a large family garden plot, Chef Boyar takes to nearby fields and forests to forage for unique flavours. From Woodstock, it’s a short drive to Ingersoll and Chocolatea, where chocolatier Cindy Walker creates everything by hand, in small batches and without preservatives. She sources local dairy products for three of her signature caramels, as well as local lavender, maple syrup and honey for her delicious chocolates. From Woodstock or Ingersoll, it’s a short drive west along Highway 401 to the beautiful city of London for a stop at the Toboggan Brewing Company. In the 1800’s, toboggan clubs existed all over London, attracting visitors from around the world—including famed author Mark Twain. The clubs built massive wooden ramps for winter sledding, the most impressive of which was a 485-foot double chute, located just a block down the street from what is now Toboggan Brewing Company. London’s Convent Garden Market is a must-taste stop for any foodie that’s looking to stock up on organic foods, award-winning meats, ethnic specialties, and the largest assortment of cheese in Southwest Ontario. The owner of Olive R. Twists features produce from his parents’ market stall in his menu on a daily basis. Tastes: The legacy of a distillery town, a Chopped Canada contestant’s take on B&B dining, local lamb burger love and a winery that’s about the people as much as the pour. Meet the food, beer and wine producers of Windsor-Essex region. From the passionate local who leads out-of-towners on walking tours to his city’s beer, spirit and food hotspots, to the B&B owner who sends his guests to his favourite winery and the winery owner who sends them to her favourite fruit stand, everyone is spreading the word about delicious things happening here. This Next Stop: Taste journey begins in a historic district of Windsor called Old Walkerville, where culinary touring company WindsorEats offers fascinating jaunts through the historic neighbourhood. Participants learn about the town that Canadian Club whisky built and the city’s architecture, and enjoy a flight of bourbon. Just 30 minutes away, Iron Kettle Bed and Breakfast in Comber offers a unique lodging experience co-hosted by internationally trained chef Benjamin Leblanc, a competitor on Food Network Canada’s Chopped Canada. His intense focus on using fresh, local ingredients is showcased in his hearty breakfasts. After a delicious breakfast, head to Kingsville for a morning of browsing through unique shops and lunch at Jack’s Gastropub, where the menu changes quarterly to reflect the region’s freshest seasonal flavours. Enjoy a signature burger like the South Woodslee, made with lamb from Ewe Dell farm. From Kingsville, it’s a short, scenic cruise to Harrow and the charming hamlet of Oxley, where you’ll find Oxley Estate Winery on the north shore of Lake Erie. Relax and take in the stunning vineyard view from the Wine Garden Patio with a glass of Wowza White in hand. Tastes: A family of beekeepers, a bayside craft brewery, a Lake Huron vineyard and an epic 3.5-pound apple pie. Veering off the route that your GPS recommends while travelling in Ontario’s Southwest can result in some very delicious detours. Friendly locals will point you to their favourite spots including craft breweries, honey farms, wineries and orchards where you’re sure to encounter a cast of colourful characters and farm-to-table flavours. This Next Stop: Taste journey begins with a buzz just outside the quaint little town of Alvinston. Munro Honey and Meadery has been producing honey for four generations and was Ontario’s first mead producer in 1999. Local fruits including rhubarb and strawberries are used to give this wine-like beverage a distinct flavour, and sampling is a must. Head toward Huron with a scenic trip to Alton Farms Estate Winery in Plympton-Wyoming, where a passionate husband and wife team hopes to create a newly recognized Ontario wine region, the Lake Huron South Shore. These groundbreakers are producing unique wines with a truly distinct taste of place, and each harvest season invite volunteers to pick, bottle and label their wines. Next, make for another Great Lake, journeying back in time to the main street of Erieau on Lake Erie. Here, one of the region’s most beloved craft breweries, Bayside Brewing Co., is housed in the former Tilt ‘N’ Hilt ‘N’ Hotel and includes brewing facilities, a tasting room, retail area and a brew pub offering delicious wood oven pizzas. Finally, wrap things up with a trip to Apple Land Station in Thorndale, home to a whole crop of farm-themed activities including pick-your-own apples and pumpkins, a farm train, a corn maze, and adorable barnyard animals. The onsite bakery offers freshly baked apple pies that are truly epic — each one is piled high with 3.5 pounds of apples! Tastes: Beloved brews, organic greens, farm fresh bistro dining and award-winning ciders. This Next Stop: Taste journey begins in Sarnia, just a stone’s throw from the Blue Water Bridge and the international border between the U.S. and Canada. Refined Fool Brewing Co. is a group of teachers, creatives, blue collar workers, entrepreneurs, musicians and pastors who care about beer, business, Sarnia and each other. At the other end of Highway 402, the certified organic greens and micro greens don’t come any fresher than those you’ll find at Slegers Organic Greens in Strathroy. The plants are sold with the root systems intact. That live energy creates more vibrant flavour than anything you’ll find at the supermarket. Enjoy Slegers greens in a meal at The Clock Tower Inn, Bistro and Pub in Strathroy. Chef Mark Graham has passion in spades for the region’s farm-to-table ingredients and for the historic post office that he painstakingly restored into a thriving destination restaurant and inn. Wrap up your day with a trip to the orchard and get a taste for the award-winning ciders that the Vansteenkiste brothers are creating at Twin Pines Orchards and Cider House. Having caught on to the North American cider trend in its infancy, the brothers have had a solid decade to perfect their craft. Tastes: Fresh from the lake perch, authentic local culture, award winning wines and amazing farm-to-table dishes. The birds and butterflies aren’t the only species flocking to the shores of Lake Erie just outside Windsor – a growing collection of in-the-know foodies are migrating to the area, drawn to the buzz regarding one of Ontario’s best agritourism regions. This Next Stop: Taste journey begins within stone skipping distance from Point Pelee National Park at Birdie’s Perch. The bright red, 1965 double decker bus can cook up a whopping 75 pounds of fresh Lake Erie perch on a busy day, and with one bite of their signature crisp, lightly breaded treat with the owners’ secret tartar sauce, you’ll know why. As you drive up the long road into Cooper’s Hawk Vineyards in Harrow, roll down your windows and listen for the distinctive cry of the Cooper’s Hawk. Rolling vineyards, an expansive patio and beautifully landscaped greenspace may make you think you’ve been transported to Napa at this stunning winery. Wrap up a day of tasting and touring with a little taste of Provence along the Lake Erie shoreline. North 42 Degrees Estate Winery is named after the line of latitude it is perched upon that just happens to cut through some of the world’s greatest wine growing regions. 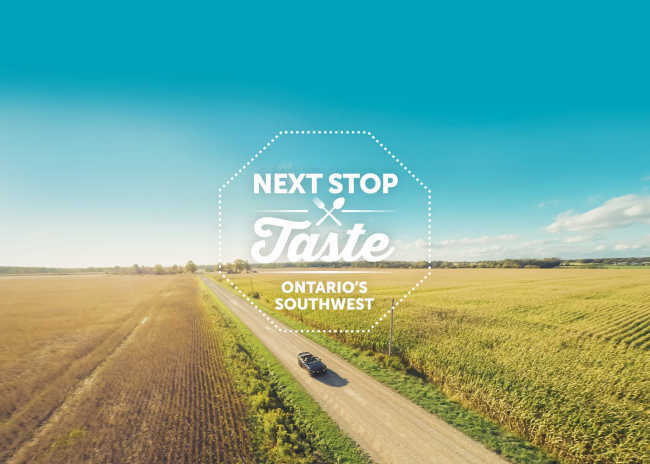 If you’re up for more tasty adventures, check out the entire Next Stop Taste video seriesto guide you on your travels discovering the best wine, beer, cider, crops and cuisine in Ontario’s Southwest. Make sure to check back often as new episodes are added.